Michigan Corn Crop Doing Well…..
..other crops, not so much. But several freezes during the spring killed off many blossoming tart cherries, apples and grapes. Production of those fruits this year is expected to be way down. Corn, however, has had a perfect year and with massive flooding in the corn belt wiping out most of the crop in Iowa and parts of Illinois and Indiana, it should be a good year for anyone who still has something to bring to the elevators. …..farmers in the state can expect a record-setting yield of 148 bushels per acre in 2008. The U.S. Department of Agriculture also says corn production in the state should surpass 307 million bushels this year, shattering a 26-year-old record. Oh yeah, a sugar beet growers are also likely to see record yields. Lately, I’ve been doing a little label reading to see what I can cut out of my diet. Most of the calories and sugar I get are from Pepsi which is pretty much like crack to me. I’ve tried cutting down, but I get irritable when I’m craving one. Since I started dating my girlfriend, she’s been trying to get me to eat healthier bread. For the most part, I’d grab the store brand generic white bread that was $.99. It seemed like such a waste to spend $4 on bread. I gave in a few times and tried some of the “healthier” bread that she wanted me to try and they all tasted like crap. They weren’t very dense and went stale pretty fast. It just wasn’t appetizing. Last week, I was at Kroger and I started reading labels. 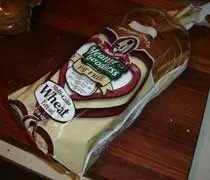 My goal was to find a loaf of bread that didn’t have high fructose corn syrup (HFCS) or enriched wheat. That proved to be a lot harder than I thought. Even the healthy stuff my girlfriend keeps trying to get me to buy has both. As I was about to give up and just buy the cheap stuff, I picked up one final loaf. It was a brand I’ve never heard of, but right on top of the packaging, they were advertising the fact that their bread didn’t have HFCS. The brand? Aunt Millie’s. Aunt Millie’s is a regional bakery based in Ft. Wayne, IN that serves five states in the Midwest including Michigan with four bakeries in Michigan (two in Coldwater, Jackson, Kalamazoo, and Plymouth). I picked up a loaf, but it was over $3. I figured this one time, I’d give it a try. I didn’t have high expectations because healthy bread usually didn’t taste good. Aunt Millie’s is an exception to that rule. I can’t tell any difference between this bread and the cheap bread I usually prefer. Still, $3.18 is a little high for bread….good thing I found it at Horrock’s for $1.80. I’m sold now. 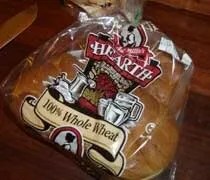 Last time at Horrock’s, I picked up another loaf of wheat bread and a package of wheat buns…both made with out enriched wheat products or HFCS. I never thought I’d find a healthier bread that I liked, but I did. Aunt Millie makes just about every bread that I buy. Horrock’s also had Texas Toast (which I prefer for pulled pork), hot dog buns, and even potato bread. Not my thing, but it seems that’s the new craze.